Learn how to get big hair in this Howcast hair tutorial featuring celebrity hairstylist Jacqueline Bush. I&apos;m going to show you how to get big hair. So, the first thing I want to tell you is there is a couple of tools you can use based on what your hair type is and what you want. The first thing I would recommend , which I already showed you in How to use a Blow Dryer, is when you step out of the shower you put a little bit of product in your hair. You can use a volumizing mousse, you can use gel, you can just even use their volumizing sprays out there. For our model&apos;s particular hair texture she actually doesn&apos;t need that, she does get a lot of volume so I&apos;m not using a volumizing spray. I did use a little bit of heat protector on her hair just because we are going to use heat on it to get the extra volume that we need. So, you&apos;re going to flip your head over, you&apos;re going to rough dry it until it&apos;s about 85 percent dry. Your blow dryer should be on hot, and you&apos;re just going to not worry whether the hair&apos;s getting frizzy or whatever, that&apos;s not the point. What this is doing this is giving it a lot of lift and volume and embracing its natural texture. You&apos;re going to do this until your hair is about 85 percent dry and when I&apos;m in this position what I like to do is focus on the roots because the more, the drier you get your roots here that&apos;s going to give it that extra lift, like the building blocks for the start of giving it more volume. So, we&apos;re going to do that really quick and then I&apos;ll show you the next step. Now I&apos;ve blow dried Sibola&apos;s hair until about 85 percent dry. It&apos;s still a little damp, not too damp but a little bit because this is what&apos;s going to give us control for the next step. Now if you don&apos;t have time and you don&apos;t want to use a brush on your hair, I would just go ahead and blow dry the rest of this through, making sure you&apos;re focusing on the hair going in an upward direction because to get volume your hair needs to go up. 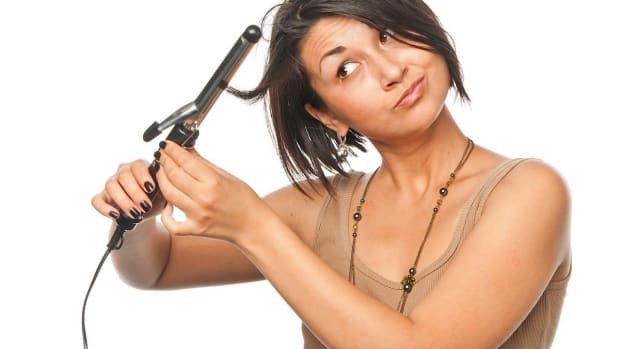 If you blow dry downwards, your hair is going to go in a downwards direction. So, just think about gravity. So let&apos;s say you don&apos;t have time for a blow dryer, real quick I&apos;ll show you just keep rough drying your hair, focusing on getting the volume, quite large. You can even take some hair spray after it&apos;s dry, spray the hair a little bit, keep blow drying that will give it a little bit of extra hold or the other trick you can do, round brush. This is if you have time obviously. This kind of brush is a boar bristle brush and what it does it actually give more volume and lift to your hair. This is a brush created for volume. So, after your roots are mostly dry, your hair is in this state, what you can do is section by section (the way you&apos;d measure that is measuring about the section of the brush, the smaller the section the more control you&apos;re going to have). Section by section focusing on blow drying the hair in the opposite direction it goes that&apos;s what&apos;s going to give you lift. For example, we have our model&apos;s hair here naturally it falls straight down, To give it extra volume and extra lift, what I&apos;m going to do is I&apos;m going to take that section and at the root of her hair I&apos;m going to blow dry in the opposite direction, focusing on that root making sure it gets nice and dry and then as I dry the hair I&apos;m going to kind of keep it there, blow drying it all the way up and when you see our finished product, that&apos;s what&apos;s going to give her extra volume. So let me show you that in one section for you. So, now that we&apos;ve got our section dry as you noticed my brush is still in the hair. This is because you have two options right now if you really want to get your volume to stay all day. If you have the time you can throw in a Velcro roller. Now the important thing with this is the hair is still warm so throwing in a Velcro roller in this section, let the roller cool and then you can pop it out. If you don&apos;t have time for that, what you can do is take a little hair spray, remember earlier I mentioned a little hair spray, blowing it can give you a little extra volume, you can do the same thing here. We can take our hair spray, spray that section, we&apos;re going to blow dry it just a little bit and that&apos;s to dry the hair spray. That&apos;s what&apos;s going to hold it and we can pull that section out and as we pull it out, we&apos;re not going to brush down and pull the hair out; we&apos;re just going to gently remove the brush. As you can see she has all this volume, we didn&apos;t try that hard. Then what you&apos;re going to do is work your way around the hair, section by section, doing the same thing and that&apos;s how you get big hair.